CD reviews tend to be consumer guides, a few paragraphs that boil the music down to a buy/don’t buy advisory note. At The Complicatist, we’re pointed in the opposite direction. Each month, this column will be featuring a song or album that’s as complicated as anyone cares to make it be. The rarest art criticism is the kind that changes the way you hear or read a piece of art, forever. Daniel Wolff’s essay about the Elvis Presley song ‘Are You Lonesome Tonight’ was a case in point for me. This was already an old, old song (written in 1926) even by the time that Presley got to it. These days, it is generally treated as a joke, particularly the spoken monologue. 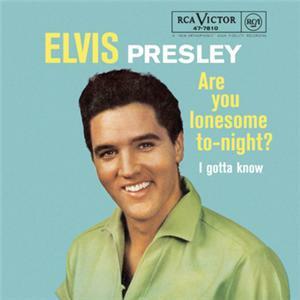 Wolff’s genius lay in treating ‘Are You Lonesome Tonight’ not as a love song, but as a vehicle that Presley was using to portray his own mixed feelings about his audience. Seen in that light, it suddenly becomes a statement about the willing trade in illusions that go on between celebrities and their fans. More than a decade before David Bowie forced rock music to deal with its theatrical, self-reflexive aspects, Presley was, in this song at least, inviting singers and audience to regard themselves as performers on a stage, each with their fickle needs to satisfy. at 4 am on April 4, 1960, just after Elvis had finished his two year stint in the Army, and just before he began to treat Hollywood as the most sensible way of prolonging his career. At the time, rock’n’roll still seemed like it could fizzle out as a transient fad. As Wolff points out, Frank Sinatra had recently used the movies to revive and extend his music career, and that seemed like a fairly sensible model for Presley to try and emulate. At this watershed moment, Presley chose to record a song that discussed the restoration of a relationship, once the initial thrill had gone. In content and delivery, it is an amazingly intimate song. One of the paradoxes of celebrity is that it while it offers a sense of personal intimacy – he’s singing to me, and me alone – it does so on a massive scale. Your song is coming over a million bedroom radios, at once. Presley then follows through to the mutual need that causes any artist to strike a deal with their treacherous admirers. ( ‘Honey, you lied when you said you loved me / and I had no cause to doubt ….but I’d rather go on hearing your lies / than go on living without you..) Finally, it becomes possible that a relationship of sorts – with all of its inherent compromises – can be renewed, just so long as both parties know and accept the limits of the deal. So Elvis made a pact with his fans, and they kept their side of the bargain right up to his death and beyond. I won’t try to paraphrase any further the argument that Wolff makes for this take on Presley, and for this reading of ‘Are You Lonesome Tonight.’ Safe to say, the essay achieves what it set out to do. It completely demolishes the notion of Elvis as a purely instinctive artist, a hillbilly natural who got seduced by Colonel Tom Parker and the lures of Hollywood. Which is of course the standard myth peddled by Peter Guralnick in his allegedly definitive biography, Careless Love. Presley’s music, and the culture he represented, was never that simple. While visiting Wellington, lead singer Will Sheff voiced his own passing obsession with the 1974 soul track “Be Thankful For What You Got “ by William DeVaughn. There’s a good video of the song available here. And when he hits that line its like he gets stuck on it. Its like he’s suddenly stumbled across the one poetic part of the song. 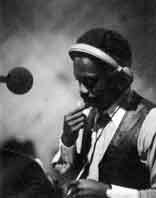 And the whole rest of the song, for the next five or six minutes ends up with him repeating that nursery rhyme style whine that evokes so much sense of wrongness and criminality and excitement, which contradicts all the hokey Curtis Mayfield stuff that he was trying to say.